When the annual run of the Grand Rapids Ballet’s “The Nutcracker” hits the stage Friday, Dec. 9, it will include staring rolls by the company’s professional dancers and, as always, often a stage full of youth dancers. The classic family holiday tradition returns to DeVos Performance Hall for two weekends — Dec. 9-11 and Dec. 16-18 — with four evening shows and four matinees. Live orchestra music is provided by Grand Rapids Symphony. Grace, a 16-year-old junior at Grand River Preparatory High School, has been dancing at Grand Rapids Ballet for 11 years and has been a member of the Junior Company since its inception. This year will be her 8th Nutcracker appearance. She also loved The Nutcracker, thanks to her father, Ronald. Seven productions later, she is still excited about the annual holiday production. 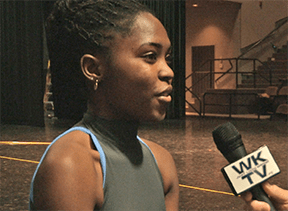 According to her mother, Sandra, Grace hopes to dance in college while pursuing professional opportunities. But she sees dance as a means to other career paths as well. One of the people she has shown the love of dance to is her sister. 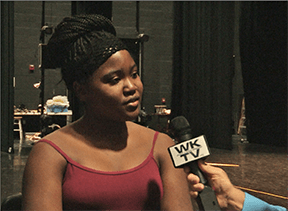 Micah, age 13 and a 7th grader at Cross Creek Charter Academy, says music is her first love — she has been playing the piano for 8 years, and her mother says she has talked about assisting with her college expenses by playing piano for ballet companies. But Micah has been with working with the Grand Rapids Ballet youth program for four years and will be in the Nutcracker for the third year. She also said she receives plenty of advice and encouragement from her older sister. “Since she is such a good dancer, she really helps me when I need help, with technique or how I am supposed to move,” Micah said. And as far as her first time in front of the usually large crowds watching the Nutcracker, any advice from her older sister? Anybody who has seen the production knows what they are talking about; those how haven’t have two weekends worth of opportunity. Why is it that even non-ballet audiences are familiar with the Nutcracker? How has The Nutcracker become an American tradition and why do so many companies and artists in different dance genres perform it regularly? Perhaps some historical context will be helpful in explaining the universal appeal of this holiday dance extravaganza. Today almost every major ballet company in the US and Canada, as well as companies throughout Europe, perform this ballet. There are hip-hop adaptions and even Duke Ellington, the great jazz musician, composed his own version of the music. The Nutcracker, a classical ballet created over a century ago, is a successful tradition, artistically and financially. Despite competing claims for the “original” version of the Nutcracker, there are a series of historically incontrovertible facts. The Nutcracker (or “Casse–Noisette”), a Classical Ballet in two acts and three scenes, was first choreographed in December 1892 and produced in St. Petersburg, Russia by the Maryinsky Ballet. Originally the choreographer was to be the famous father of classical ballet, Marius Petipa. Petipa was a Frenchman who had quickly risen in the ranks of the theatre and developed the classical ballet genre over the span of sixty years of innovative choreography. However, as he began to work on the Nutcracker, Petipa fell ill, and it was left to his assistant, a Russian, Lev Ivanov, to complete the bulk of the work. The story, also credited to Ivanov, is derived from the E.T.A. Hoffmann tale, The Nutcracker and the King of the Mice. As in most classical ballets, the story line does not exactly follow the written version, with liberties taken to increase the scenic spectacle and place emphasis on the dancing roles. In short, Nutcracker is the story of Clara, a young girl whose family is entertaining friends and neighbors at a party in her parents’ home. Here we meet (depending on the production) all types of characters, including performing dolls, and Clara’s mysterious uncle Drosslemyer. Clara is given a nutcracker doll as a gift by her eccentric uncle. Her brother Fritz then attempts to steal it from her. During the ensuing chase, the doll is broken, and Drosslemyer consoles Clara as she places the doll under the tree for safekeeping. After the party, the guests leave and Clara and Fritz are sent upstairs to bed. Clara, however, cannot sleep, and creeps back down the stairs to check on her nutcracker. She falls asleep with the doll and begins to dream. The ballet then leaves the world of realism and turns to fantasy. The small Christmas tree seen in the first act begins to magically grow skyward as large mice, one with a crown on its head, start a battle with the nutcracker that has come to life, portrayed by a dancer wearing a nutcracker mask. During the battle, the King mouse is distracted by Clara who strikes him with her ballet slipper, enabling the nutcracker to slay him. The nutcracker removes his mask, completing his transformation into a real Prince, and then escorts Clara to the land of the Snowflakes. Here, the “Waltz of the Snowflakes” is performed, concluding the first act. The second act, set in the “Kingdom of Sweets”, is a series of divertissements viewed by Clara as if still in a dream. These dances often represent, more or less, countries and dances throughout the world. Clara is given a seat of honor where she presides over the action. The ballet ends with Clara awakening back in her home with the toy nutcracker in her arms. She and the audience are left wondering how much of the ballet was a dream and how much reality. Ivanov had already assisted Petipa with another classical ballet, Swan Lake, where he is credited for the impeccable musicality and phrasing of the choreography in the 2nd and 4th acts. The music for the Nutcracker was again by the same composer, Pyotr Ilyich Tchaikovsky. Perhaps Ivanov had an affinity for the music of Tchaikovsky; we know that the composer was greatly impressed with the choreography when he saw the ballet performed. While composing the music, Tchaikovsky is said to have made a bet with a friend who asked if the composer could write a melody based on the notes of the octave in sequence. Tchaikovsky asked if it mattered whether the notes were in ascending or descending order, and was assured it did not. This resulted in the Grand Adage section of the “Grand Pas de Deux”. Among other things, the score of The Nutcracker is noted for its use of the celesta, a featured solo instrument in the “Dance of the Sugar Plum Fairy” from the second act.Tchaikovsky had doubts about his creative work and initially was not pleased with his composition. Eventually, as he worked on the score, he came to think his music had potential. In the Maryinsky production, Antonietta dell’ Era, an Italian ballerina, appeared in the leading role of the Sugar-Plum Fairy. Other roles were performed by a veritable who’s who of ballet history, with Paul Gerdt dancing the part of the Prince, Olga Preobrazhenskaya one of the clockwork dolls, and Sergei Lagat dancing the Nutcracker. Although the ballet continued to be performed in Russia after the premier, it was not an unqualified success. Critics complained of a disjointed storyline, too many children in the cast, and some, surprisingly, even disliked the score. Tchaikovsky died within a year of the staging never knowing how popular his music would become. It was left to the Russian émigré community to promote the Nutcracker tradition. As early as 1932 a few Russian expatriates were staging partial Nutcrackers in Vancouver, Canada, and Portland, Oregon. In 1934, a version was performed at London’s Vic-Wells (later named the Royal Ballet) staged by Nicholas Sergeyev, who was the Maryinsky Theatre’s former chief regisseur. In the United States, audiences became familiar with the Ballet Russe de Monte Carlo’s condensed Nutcracker. It had a brief party scene in the first act, moved quickly to the Snowflake Waltz (which was eventually eliminated in their presentation) and then on to the second act divertissements and “Grand Pas de Deux”. That specific choreography, for the “Pas de Deux” section of the complete ballet, was still being passed on to new generations of dancers in many regional American ballet companies as late as the 1980s, with staging by the masterful Ballet Russe dancer, Frederic Franklin. The first full-length restaging of the ballet is often attributed to George Balanchine, but there was another company that preceded New York City Ballet’s storied version. As one of three brothers in a dancing family, Willam Christensen first put together the second act divertissements in Portland with the help of a Russian émigré composer, Jacques Gershkovitch. Christensen knew nothing about the production but choreographed an inspired series of dances that drew raves in Portland. By the 1940s, Christensen had become the founder and director and of the San Francisco Ballet, a company originally associated with the Opera. Looking for a full-length ballet to establish the fledgling company, Christensen chose The Nutcracker. He again drew on the Russian community, picking up details of the staging that were missing from the abbreviated version performed by the touring Ballet Russe company, a version that he had undoubtedly seen. His brothers Lew and Harold were both dancers who performed under the direction of George Balanchine, who was working in New York before the formation of his company, the New York City Ballet. When Balanchine, who was choreographing for the Ballet Russe Company at the time, arrived in San Francisco, Christensen invited him to his apartment to ask questions about the original staging. Balanchine encouraged him to choreograph his own steps and acquainted him with the previously unknown buffoon character, Mother Ginger, who appears in the second act. Staged in 1944, the success of this full-length production helped establish San Francisco Ballet and Willam Christensen as its director. However, the company did not do regular December performances of the ballet until the 1950s. After the New York City Ballet’s successful 1954 premiere, the ballet was scheduled for an entire month of performances the following Christmas. Now that full-length versions were regularly performed on both coasts, its popularity soared. Part of the appeal can be attributed to the secular observance of Christmas in North America. The ballet dovetailed neatly into what is often considered a festive children’s holiday without the somber overtones of religious themes and rituals. Children in the cast also added to the popularity of the ballet, resulting in a wider audience and more accessibility, especially for those who considered ballet to be elitist, or not popular, entertainment. Balanchine and his company also enjoyed an unexpected benefit of having children in the cast. Their presence contributed to the financial success of the ballet by having more of the extended families participating as audience members. There are few certainties in the business of promoting classical ballet, but presenting The Nutcracker often ensures an audience and can thus be counted on to allow a company to meet its financial obligations. The Nutcracker today In America, it is possible that four generations of the same family have delighted in watching this ballet. Given its long history, the ballet invites a wide range of dance styles and staging. Each company seeks ways to make the production feel new. Some companies infuse a local atmosphere into the ballet, especially in the first act. The local historical context can increase the audiences’ enjoyment as they recognize references seen in the ballet that relate to their own lives. Nods to history and the use of artistic and renowned personalities in the staging thrive, as ballet companies continue to find fresh approaches. A perfect example combining these aspects of production emerged in Seattle, Washington, where Kent Stowell’s version had sets and costumes designed by the famous children’s author Maurice Sendak – a tradition for Seattle-area audiences since 1983. It is now being replaced by the original 1954 Balanchine version. An interview with one major American ballet company director revealed that the choice of how to shape a new production, or even terminate an old one, is fraught with conflict. He described presenting the ballet as if it were a restaurant. The food must be good enough to have the customer enjoy the meal but not so extravagant that they cannot see themselves coming back to dine again. There are competing interests to pay attention to. The Nutcracker needs to be a success and continue to draw in an audience, especially one that may not regularly attend the ballet. At the same time, it must have high artistic quality, enticing the audience to see other diverse company productions. Regardless of the history or local flavor costumes and sets choose to highlight, ultimately, the choreography and dancing remain key to stimulating interest. Thankfully, those of us who love The Nutcracker can breathe a sigh of relief. In one form or another this ballet, now well over one hundred years old, will continue to be a beloved holiday celebration. Each year a party will happen; Clara will dream; the mice will fight soldiers, and the audience will be taken to a magical land where they can dream… at least until the curtain falls. The author, Charles Flachs, professor of dance at Mount Holyoke College and co-director of the Massachusetts Academy of Ballet, was transported into a dance career partly by watching the New York City Ballet and Pennsylvania Ballet Nutcrackers as a young ballet student.